Explore yourself through travelling to Middle East. Middle East comprises some Arabic and gulf countries where visitors enjoys especially the traditional Arab culture. Travel Mate have a planning for your Arab trip. Some of world’s most amazing and finest tourist spots are in Middle Eastern countries like Dubai, Saudi Arab, Iran, Bahrain etc. These countries have a lot of entertainment places for every age of people where an old person enjoys equally as younger can do. You can visit some luxury resorts at beachside for the relaxation and fresh air where you can refresh yourself and feel yourself active and efficient. The main entertainment of Middle East is Arab Culture as you enjoy some camel riding, night camping in deserts traditional Arab dance at streets with delicious food. Some of the Largest Buildings of the world are also here to entertain you, where you can enjoy the sight of city from that high peak and underwater dinning is also famous among tourists. The Luxury Malls, world class aquariums and resorts along with some mobile bazars are the primes of Middle East. Two main Holy place of Muslims Mecca Medina are also here. 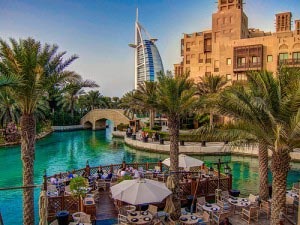 Let Travel Mate be your companion of Middle East tour and make it memorable.